So Loretta Lynn sums up her skill as a songwriter, making it all seem very simple. And yet, as her new book suggests in its publication of the lyrics from the many, many songs she has added to American country music, nothing could be further from the truth. Instead, Honky Tonk Girl, in presenting the lyrics, the great pictures, and moving memories that together knit up the tapestry of her life, stands testament to both that life and to the career of a great artist. “Loretta produces a concertina file in which you might keep receipts or invoices. On it is a label that reads SONGS, Foolscap, legal yellow pad, telephone message pad paper, and not scribbled on the backs of receipts all tumble out onto the table. “There are so many titles and opening lines that it is hard to know where to start . . .
“I pick up a piece of cardboard and realize that I am not staring at an unfinished or unreleased song but a first draft of one of Loretta’s biggest hits—I want to say it was ‘You Ain’t Woman Enough,’ but my memory might be deceiving me. But it really was a song that was famous. “Loretta laughed at the idea and turned the piece of cardboard over. It had been torn off the packing from an item of underwear and must have been all that was available when inspiration struck. Thank goodness for that cardboard. Loretta Lynn tells us her secrets in the pages of Honky Tonk Girl. 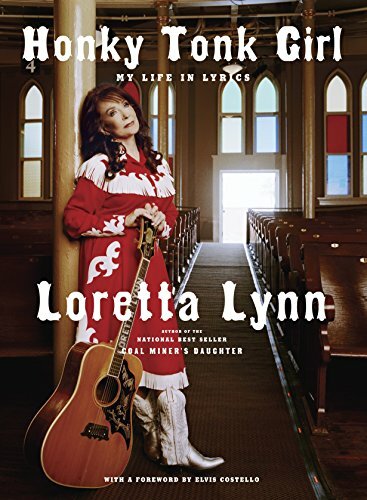 Having already told her life story in the memoir Coal Miner’s Daughter, here Ms. Lynn concentrates on her body of work and the many songs, from “You’re Lookin’ at Country” (“I’m about as old-fashioned as I can be and I hope you’re likin’ what you see/’Cause if you’re looking at me you’re lookin’ at country”) to her musical threat to the “other woman,” “You Ain’t Woman Enough,” (about which she writes, “I gave birth to this song, and I felt every little bit of the pain in these lyrics.”) to “What Kind of Girl Do You Think I Am,” which was banned by some radio stations unheard because of its suggestive title. Honky Tonk Girl gives us the full story of Ms. Lynn’s career as a songwriter from her earliest days (“I came to Nashville looking like Annie Oakley’s long lost sister!”) to present day. Her songs follow suit, ranging from 1959 and the rather ironically named The Story of My Life (a rather immense title from one so young, who was just starting out on such a long and successful career) to those gathered together for the 2005 multiple-Grammy–winning Van Lear Rose, and beyond (Ms. Lynn also includes lyrics for some songs as yet unrecorded and unreleased). Please do, Loretta. Please release it and many, many more. Vinton McCabe is a critic-at-large, whose running commentary of pop culture began more than 20 years ago in the pages of the Advocate Newspapers of CT and MA, continued on the pages of New England Monthly, and blared out of radios tuned to WGCH in Greenwich, and other Connecticut stations. He is the author of the novel Death in Venice, California.